It's October, yes I know you can probably read a calendar but I cannot believe how quickly this year has gone. It seems to have just flown past, I hoped to achieve so much but it seems another year will be passing with still lots on the to-do list. Whilst life has been flashing by before us, I've kind of let my blog take a side line and I haven't been around as much, and not half as many personal posts anymore. I had a little bit of time where I didn't want to write personal, finding out some particular people were reading and then b#t#hing about me, so since this, I've really struggled with posting. 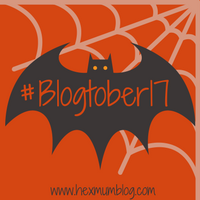 So to get myself back into the swing of things, I've decided to take part in #Blogtober17 which is basically a new post everyday with a prompt for the whole of October, 31 new posts. Now I've attempted these kind of things before and always fail, so I'm not making any promises. The first prompt is All About Me, of course I have a sub-heading here for that but this will give a bit more I guess - plus that needs a lot of an update. So I'm Zoe, I'm 26 (gah!) and from Wolverhampton. Live with my partner Ashley and we have two children. Neither of the children were planned - but whatever is meant to be right? Both children we conceived on the pill, I always get greeted with - well you must have been taking it wrong, or missed one - I can assure you not. Since having the children our lives have become a lot more hectic and I cannot remember the last time I had time to myself, but for me they are the most important. We have been through a number of pets, I've grew up with lots of pets around, so to me life is strange without. When I was younger, I had a rabbit called Rosie, and a guinea pig called Jim, I placed a rubber duck on top of the cage and every morning and evening would sing 'Rosie and Jim' to them. We currently just have the one dog with us, after having to re-home Dottie last week, thats another story I will write about soon. So my work life, I always wanted to be a children's nurse, that was my life goal. I went onto college and studied a Diplomia in Childcare and Education but my tutor forgot to notify me about University openings and I knew I wouldn't get a decent choice then so ended up missing out. As I have no confidence and I'm really rather shy I ended up never applying as I didn't want to be with people a different age to me. I then carried on working within the opticians I was working within as I was put off childcare by some of my placements. I then moved onto care work and was a home care assistant for a short while before injuring myself and returning to the opticians. Whilst here I had Jack, then returned and then moved onto Boots - where I still am. Today I work as a pharmacy assistant part time since having Isla. I don't plan to stay here forever but it pays the bills. I have been trying to get back into working within a childcare setting but as I have been out of the loop for a while, its proving difficult. After much deliberation I have decided to go back to studying to help me get back into a position I wish to be in. At the beginning of the summer holidays I signed myself up-to university - open university - So I'm officially a student. I will be studying Childhood and Youth Studies and we will see where that leads up. That brings us to now, I'm not really sure what else to write about due to my confidence and shyness, I find it really difficult to write about myself.